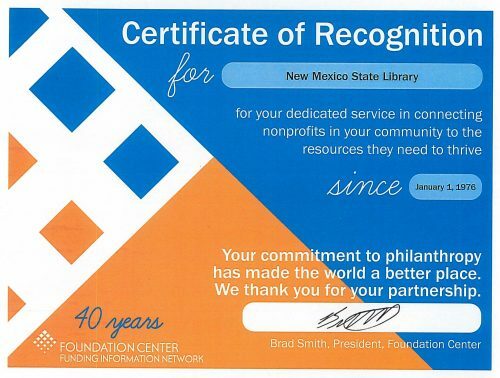 The New Mexico State Library has received a certificate of recognition for 40 years of dedicated service in the Foundation Center Funding Information Network. Since 1976, the State Library has been helping New Mexican grant seekers find the funders most likely to support them financially. As a Funding Information Network partner, the State Library provides grant seekers access to the Foundation Directory Online, which is the world’s leading grant prospect research resource. Other Foundation Funding Information Network resources available in the Library to grant seekers are: Foundation Grants for Individuals Online, and Foundation Maps Professional database. The State Library’s 40 year commitment to assisting grant seekers has made New Mexico a better place. The Foundation Center Funding Information Network collection, located on the second floor of the New Mexico State Library, is open to the public from 1:00 to 5:00 p.m., Monday through Friday, or by appointment. Call 505-476-9702 or Ask-a Librarian.